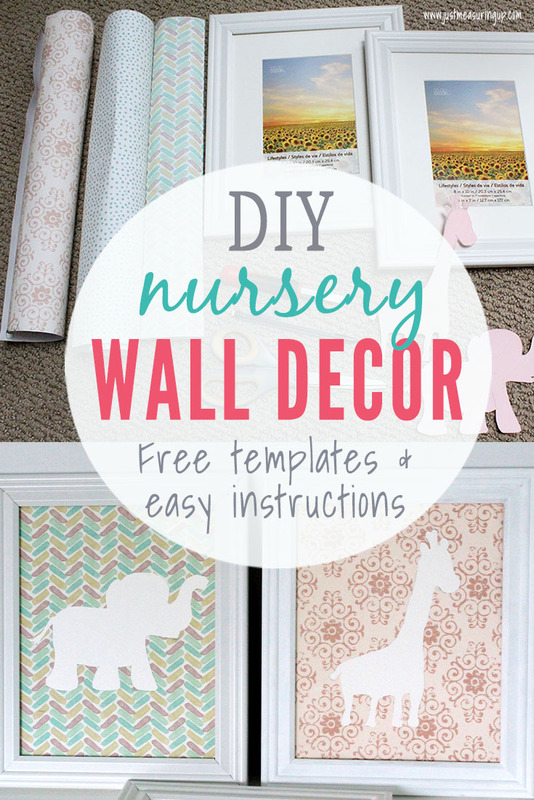 DIY Nursery Wall Decor on a Budget Post Preview: Make your own DIY nursery wall decor with this simple tutorial. 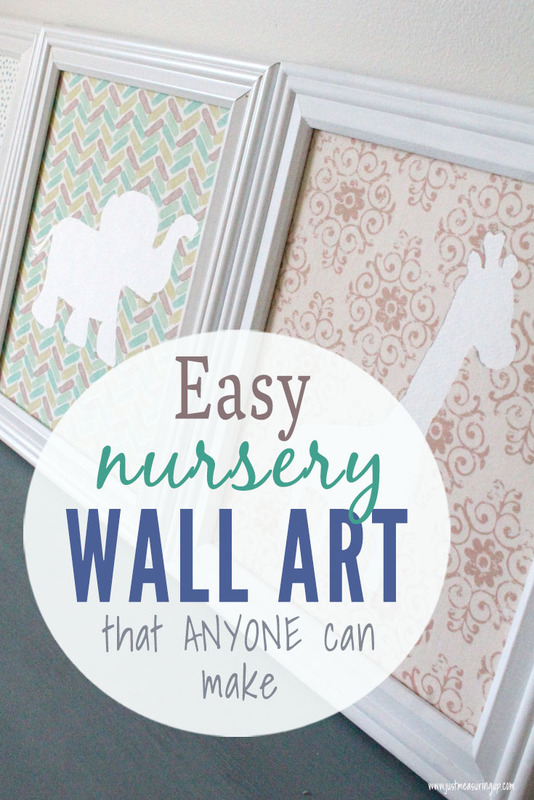 This easy wall art is perfect for anyone to make on a budget for their child’s nursery. While wandering around the craft store, I found a fun sale item – a few rolls of adhesive fabric. It was discounted and it was pretty, so of course, I bought it and stashed it in my craft room. Lately, I’ve been working on my daughter’s nursery, bringing in some brighter colors and textures – leading me back to those adhesive fabric rolls. I got out the fabric and a few other things from around the house – and threw together these easy DIY nursery wall hangings. 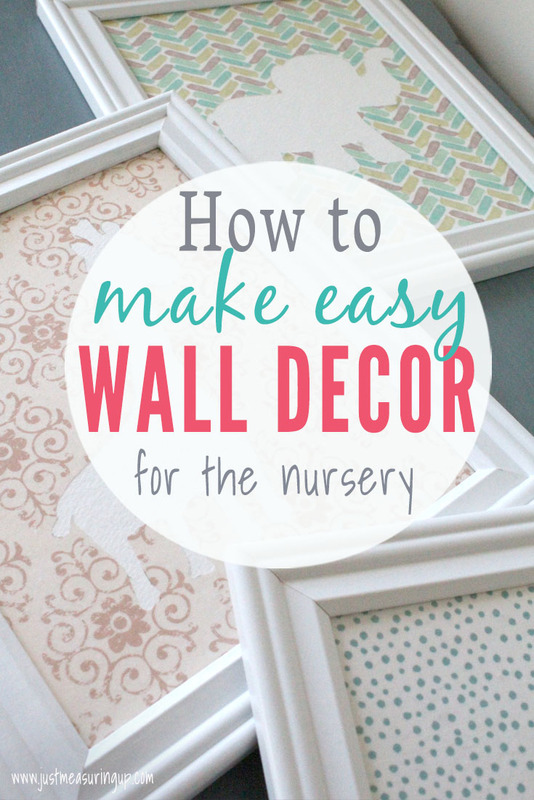 If you are looking to decorate your nursery, before you start shopping on Etsy or at Target, check out this easy tutorial – anyone can do it and you’ll save a ton of money. I also have the baby animal outlines available to you for free. 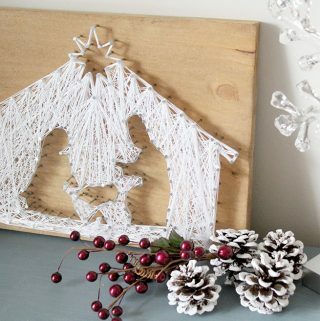 This DIY wall art is so simple to make. 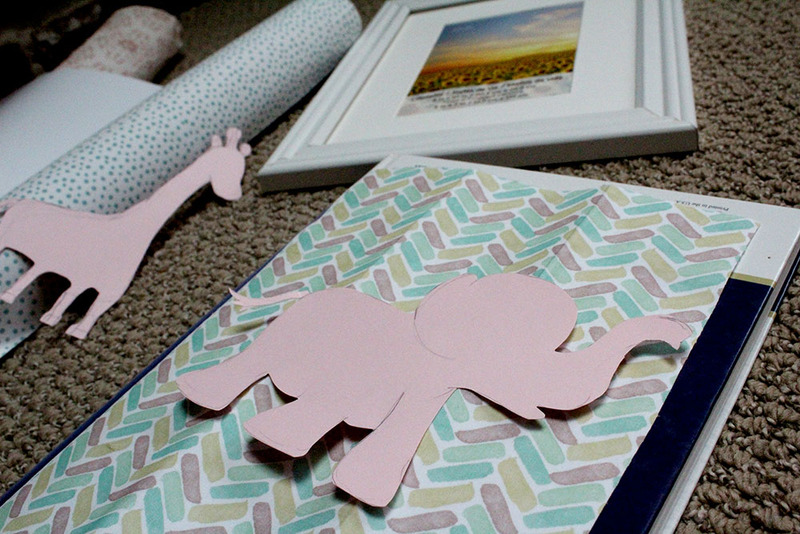 Below are the materials you’ll need to make this adorable nursery decor. If you are worried that you aren’t very artistic, almost no skills are required. 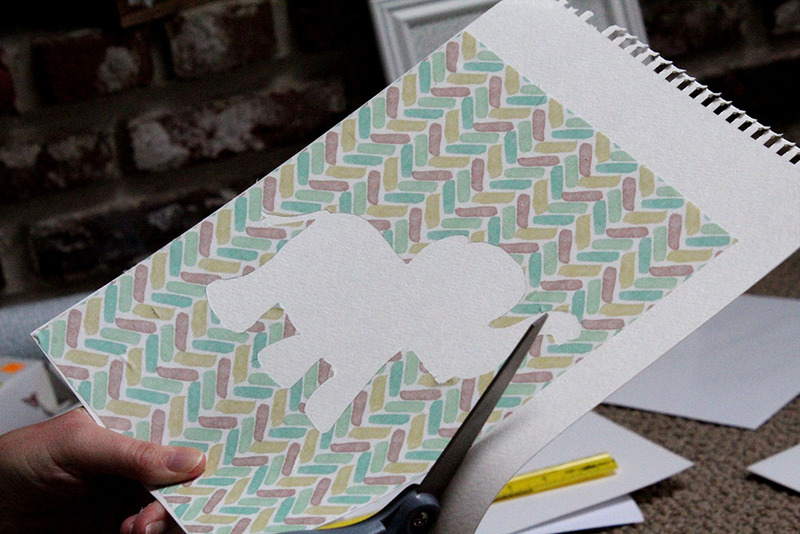 With the free baby animal templates, all you need to do is cut it out and attach. 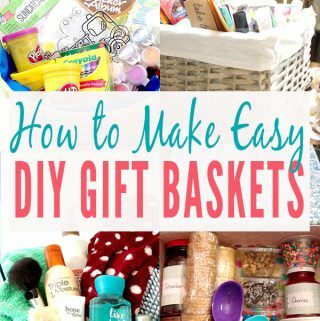 This is a perfect first DIY project that you can get done during naptime. Scissors – Use a really good pair of scissors. You’ll get a much nicer edge with a great pair. If you can’t use the adhesive fabric, you can certainly use scrapbook or card stock or some other material you find around your home. I’m all about using things from around your house! 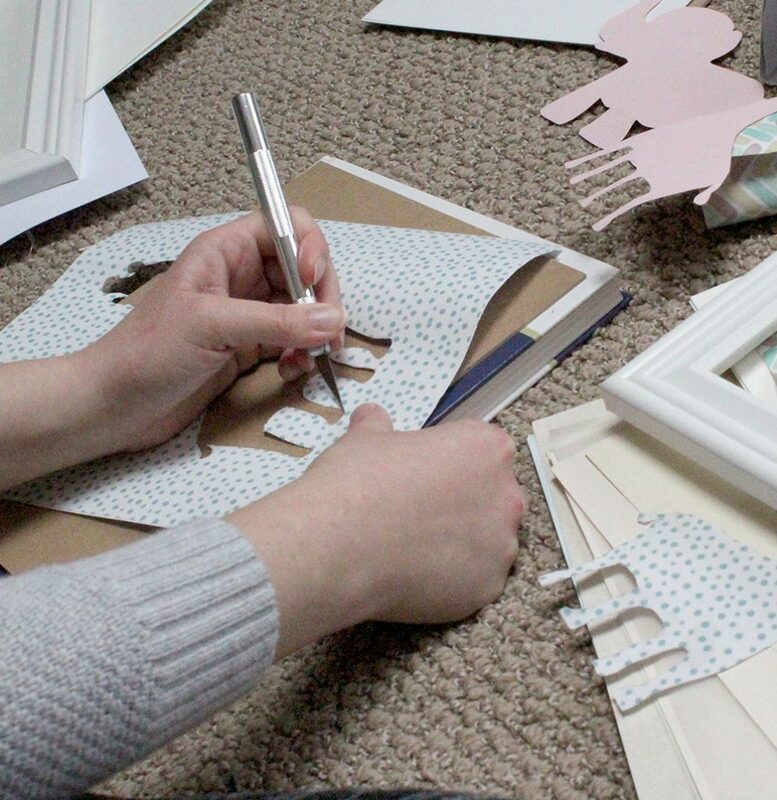 If your material doesn’t have its own adhesive, you can use mod podge or adhesive dots to place on the back. 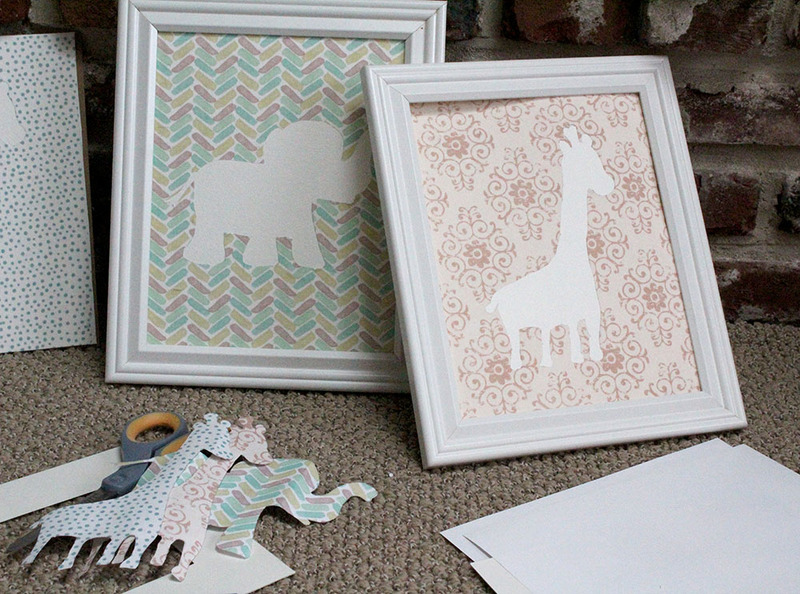 After you gather your materials, you’ll want to print out the baby animal outlines. If you can, print it on card stock. 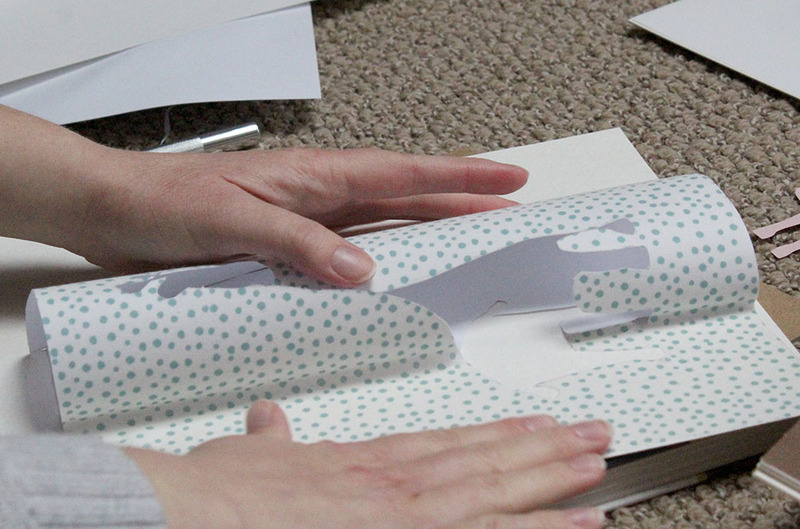 That way when you cut it out, you’ll easily be able to trace the card stock cut-out onto the fabric. If you don’t have card stock, no problem. You’ll just be extra careful when tracing. After you have printed and cut out the baby animals, trace the animals onto the BACK of the adhesive fabric. You’ll get a better cut cutting from the back (less tear on the fabric) and you won’t have to worry about pencil lines. I traced onto the front the first time – and while it looked nice, using the back was much easier and gave a cleaner look. I also made sure to center the animals vertically and horizontally. Find a hard board, big old book, or some other surface that is fine to cut on. 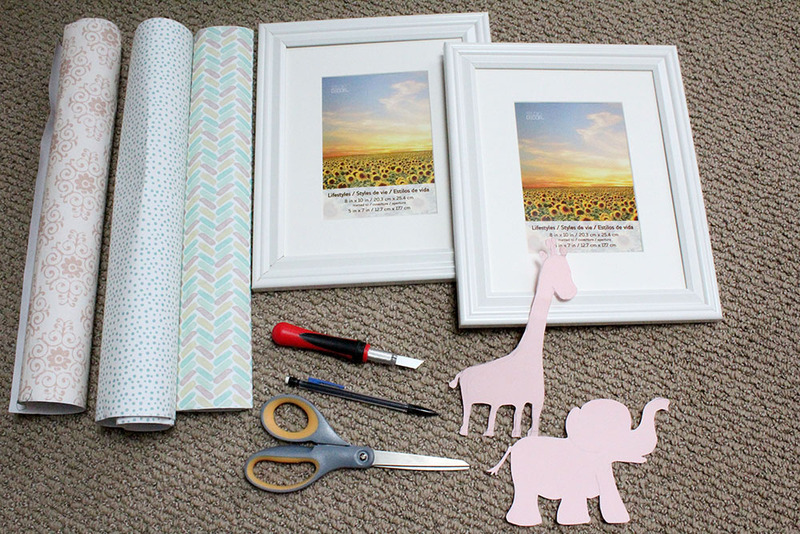 Then, use the X-acto knife to carefully cut out the baby elephant, lion, and giraffe. Remember you are using the outside of what you are cutting – not the animal itself. If you’ve never used an X-acto knife before, it’s super easy. Just practice first to make sure you can the hang of it. I found the easiest way to use the E-xacto knife is to pivot the sheet when you to make a turn, rather than picking up the knife constantly. When you are finished separate the baby animal from main piece. Choose a background to place the main piece on. I was planning on using card stock, but my card stock choices weren’t cutting it. The white looked way too harsh against my fabric. So I found some watercolor paper that wasn’t as pure white and gave the animal a little texture. Then, I carefully separate the fabric from the adhesive. I found the best way to do this was to peel off about the first inch going across. Next, I placed this part directly onto the watercolor paper. I then carefully pulled the backing as the fabric part slid onto the watercolor paper. You can also slide a ruler across the fabric – but be careful not to stretch or misshape the fabric. Placing the fabric onto the watercolor paper was very similar to using contact paper. 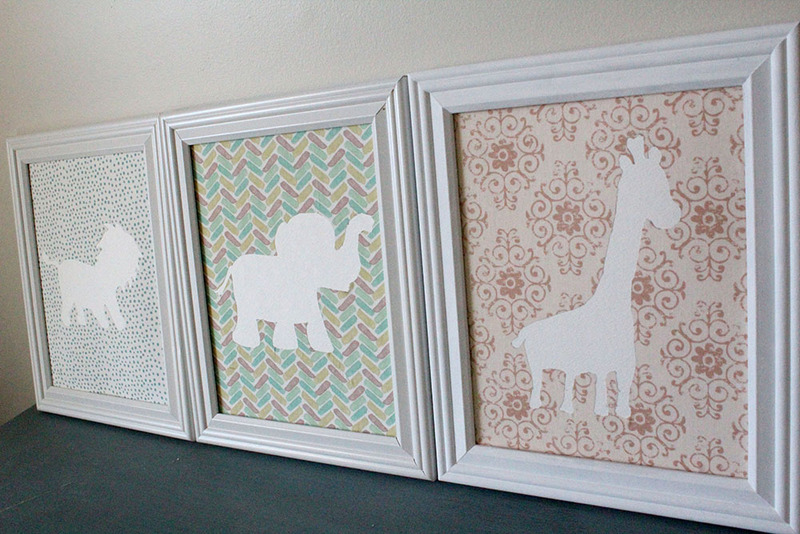 Last, choose a frame for your baby elephant, baby lion, and baby giraffe, and you are finished! How’s that for nursery wall art on a budget?! 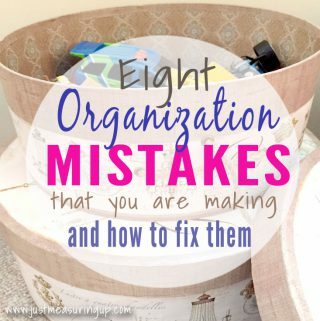 This project should only take you about an hour or so to complete. I hem and haw over everything, so I feel like things take me longer at times. However, I finished the project before my daughter woke from her nap. 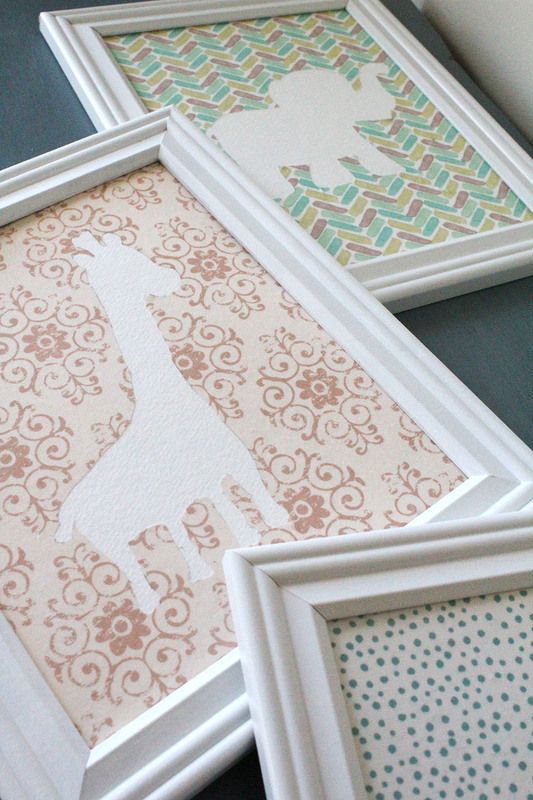 My total cost for the nursery decor wall art was less than $20 – and almost all of that was spent on the picture frames. I did get two frames on sale and with a coupon from the craft stores. The third frame I took off my wall and painted white when I decided to add a lion one too. The adhesive fabric for the nursery prints was $5 on sale. To save more money, check thrift stores and dollar stores for cheap frames and look around your house at materials you can use or reuse. 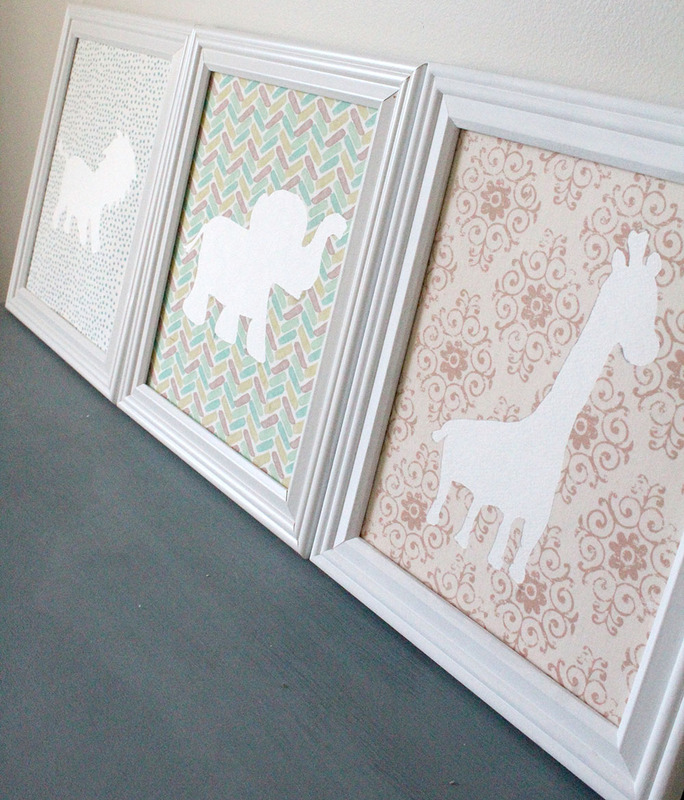 If you’re looking for nursery decor, definitely think about making it yourself. Not only will you save money while still getting nice quality art work, but you’ll have something special that you made yourself for your son’s or daughter’s nursery. And, if you aren’t that artistic – don’t worry! With the free baby animal templates. all you have to be able to do is cut. Thanks so much, Amy! Me too!